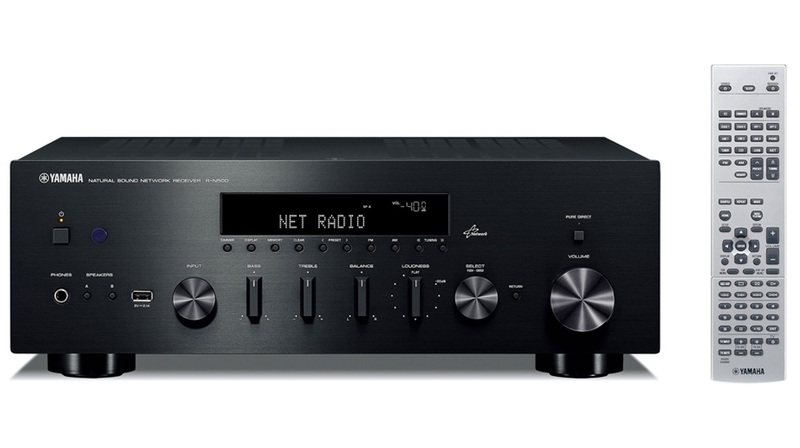 This high-performance network Hi-Fi stereo receiver powerfully reproduces a wide range of sound sources, including network audio, with unsurpassed sound quality. It features app control for easy operation and has built-in digital input jacks for TV and more. 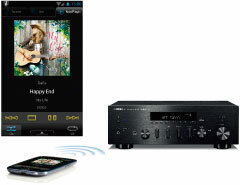 The R-N500 is a receiver and network audio player in a single unit. You can use it to easily play audio sources downloaded from the Internet and stored on a PC or NAS system or enjoy streaming music services and Internet radio (with vTuner). Moreover, Yamaha’s original NP CONTROLLER app allows you to enjoy your favorite tunes on a smartphone or tablet device via wireless connection. With the Spotify app on your smartphone, you've got instant access to millions of songs. 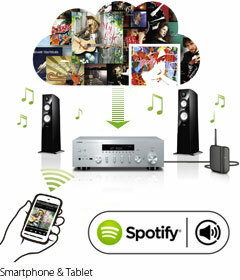 And now you can stream those songs to your Yamaha system by using Spotify Connect. Just hit play to start streaming music. What's more, when you've been listening on your smartphone outside and come inside, the song immediately streams to your receiver—like magic, you enjoy uninterrupted music. You can also personalize playlists and receive phone calls while listening to music. The Spotify app and premium account are required. Visit Spotify.com for more details. Support for the vTuner radio station database enables sampling of Internet radio broadcasts throughout the world by connecting to the Internet over a LAN. Furthermore, support for music streaming allows you to enjoy a wide variety of music content. *Available via future firmware update. Download Yamaha’s handy NETWORK PLAYER CONTROLLER app on your smartphone or tablet and use it to browse through music sources, view song information and album art, control over network and other settings. The app features a Music Play function that lets you enjoy music streaming without having to select a different app. 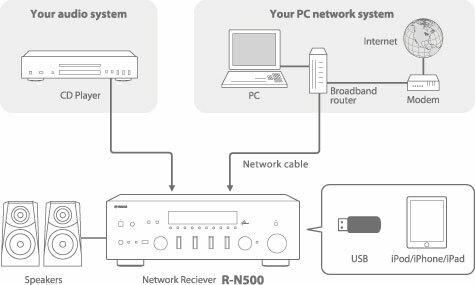 The R-N500 network receiver has virtually all of your music playback bases covered. This includes full compatibility with AirPlay—which means you get the convenience of wireless music playback from your Mac®, iPod®, iPhone® or iPad®, as well as from a PC. Compatibility with FLAC/WAV 192 kHz / 24-bit playback is built in, bringing you sound accuracy with rich expressive power that's only possible from high resolution sources. Yamaha technologies refined over many years ensure high stability and reliability. The R-N500 is equipped for digital audio input—with both optical and coaxial terminals. The optical is for receiving audio from a TV and the coaxial for receiving audio from a Blu-ray Disc player. The audio stays in the digital domain, giving you pure, pristine dynamic sound for all your entertainment sources, from sports and other programs to movies and concerts. The R-N500 provides a USB port on the front panel for quick connection of an iPod, iPhone, iPad or USB stick. You have instant access to all your stored music and the digital connection ensures that you hear it with the highest possible sound quality. Everything in the R-N500 has been built for maximum performance and high quality. The internal design utilizes simple, direct transmission of the signals—ensuring optimum separation, elimination of noise and distortion and pure sound reproduction. This includes dual independent power supplies for the two sound sources, analog and digital, as well as Yamaha’s original ToP-ART (Total Purity Audio Reproduction Technology) and Art Base chassis construction to fully protect audio signals from noise and vibration. Moreover, all parts and materials have been carefully selected and tested, to make sure they are of only the highest quality—so that they all work together to provide the absolute best sound possible. Engaging the Pure Direct switch causes the audio signal to bypass the control circuits for bass and treble, balance and the back buffer amp. This improves sound quality while maintaining full output capacity. Shortening the signal route improves sound purity, helping to reproduce even the most delicate musical nuances. The R-N500 also features a dedicated loudness control on the front panel, which lets you adjust the loudness effect as desired. Separate from the overall volume, this controls the balance of the low and high frequency sounds, providing full tonal range at any volume level, compensating for the natural loss in the human ear of high and low frequencies at soft levels. With a beautifully simple and unique design inherited directly from Yamaha’s Hi-Fi audio components, the R-N500 also boasts an easy-to-operate button layout. The aluminum front panel has a richly textured silver hairline finish. The control knobs are also of the same luxurious construction as used on our top-end models. Both inside and out, everything about the R-N500 demonstrates our commitment to superior design and operability. The R-N500 has an ECO mode that reduces power consumption by about 20%* and an Auto Power Standby function that you can set to turn the power off after two, four, eight or 12 hours.